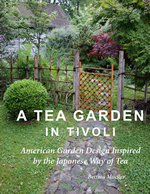 Drawing from her study of the Japanese Tea Tradition where great – even legendary – gardens are small by necessity, garden designer Bettina Mueller set out to convert her 1/10 of an acre backyard in Tivoli, NY into a private world of beauty and tranquility. The remarkable results are documented on this blog and in her latest book. Here are a couple of books that she wrote awhile ago. Both are cookbooks and available on Amazon. At various times she’s been a cook on a working tugboat, a news photographer, owner of a pioneering vegetarian restaurant and executive of a cutting edge Internet company. In addition to her interest in food and media, she’s been a lifelong student of Zen, the Japanese Tea Ceremony and the natural world.